Yesterday, We (me & mywife) were attending the ceremony of Software Freedom days at Budi Luhur University, and like any other years before, this year, echo also invited to be one of a speaker. 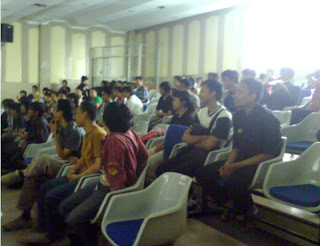 As far As I know, this is the third time echo colaborate with Budi Luhur Linux User Group to celebrate the event. 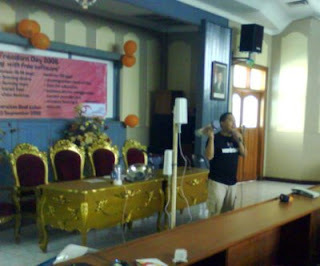 Hero, one of echo staff is talking about wireless, focusing on how to create a cheaper internet connection, based on wireless ( also share howto create the famous cantenna or wajan-bolic antenna ), az001 also give some (very) short demo penetration to one of BudiLuhur sites before the event was close, although we promise nothing would be harmed and everything patched after that. Last year echo also giving a speech in this event, and we will always support this kind of events. Hmm keren juga nih kalau suatu saat mas Ammar bisa datang dan menjadi pembicara SFD di Surabaya, gmn mas?? Mau kan?? ?